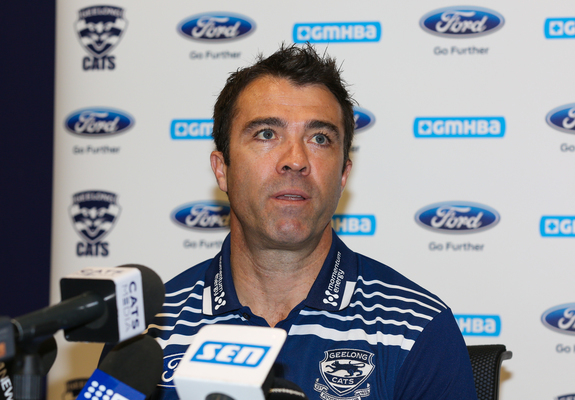 CHALLENGES: Geelong faces a tough couple of weeks, according to coach Chris Scott. Despite an unbeaten start to the season, Geelong coach Chris Scott says lengthy back-to-back breaks present the Cats with their toughest fortnight. Geelong had a five-day break before its win against Adelaide last Thursday but now has two nine-day breaks in a row. Scott linked the team’s performances to the duration of breaks. Nine-day breaks appeared benign “at first glance” but presented unique challenges, Scott said. “The biggest thing is trying to balance how much you use the extra time for more work and trying to make incremental gains as opposed to recovery,” he explained. The team would approach the long breaks “with a fresh set of eyes” rather than dwell on previous similar scenarios, he said. After a pre-season when some pundits predicted their downfall, the Cats have started the season with three strong consecutive wins, including victories against two of last year’s preliminary finalists. They Cats will take on Greater Western Sydney at Kardinia Park tomorrow before meeting Hawthorn and West Coast in following weeks. The Giants are coming off a solid 49-point win at home against Richmond. Scott considered the Giants “one of the logical premiership favourites for a reason”. Geelong will face the Giants without defender Lachie Henderson due to a foot injury that could keep him sidelined up to three weeks. “It’s unfortunate for Lachie and for us because he’s been in good from in the VFL, found his way into the team and played well for us,” Scott said. But he was confident the Cats could still put “put a good team out there” despite their growing injury list. One of the inexperienced players is young defender Jordan Clark who earlier this week extended his commitment to the club for a further two years. The 18-year-old debuted in round one this year after the Cats picked at number 15 in the 2018 draft.